Small voices can add up to be more than enough. Last Friday, these two headlines summarized the state of the economy: “Global Gloom Buffets Factories” in the Wall Street Journal and “Data Holds Some Hints of Optimism on Economy” in the New York Times. These contrasting interpretations came as WesCorp Bridge announced that the $90 million in pledged capital was not sufficient to underwrite a new corporate charter. In addition, NCUA announced that the efforts to re-launch the corporates’ net pay settlement solution had been unsuccessful. 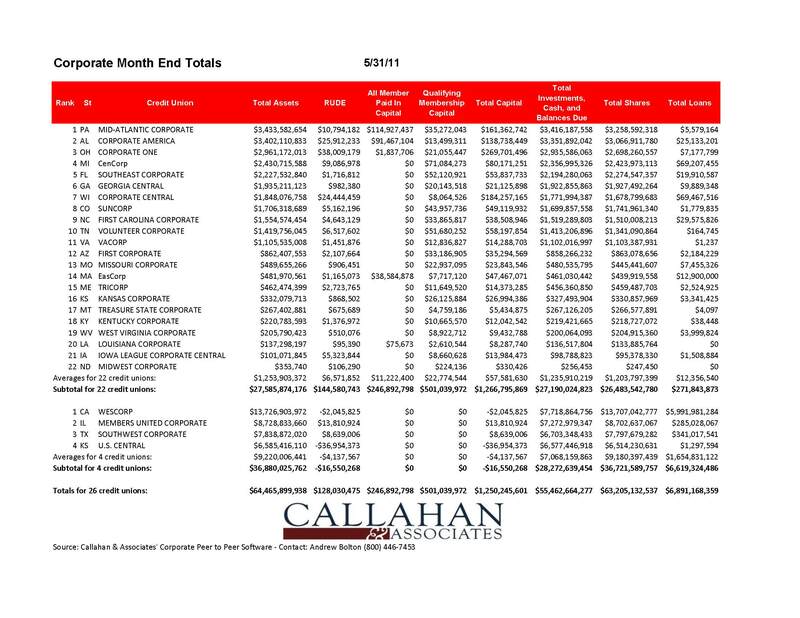 At this time last year, every corporate reported positive net income through July 2010 and the system had regained over $9 billion in OCI market valuation on investments. This momentum has continued through May of 2011, the latest available data from 5310s. All of the corporates are again reporting positive results with average ROA of 23 basis points with two exceptions: US Central and WesCorp Bridge. 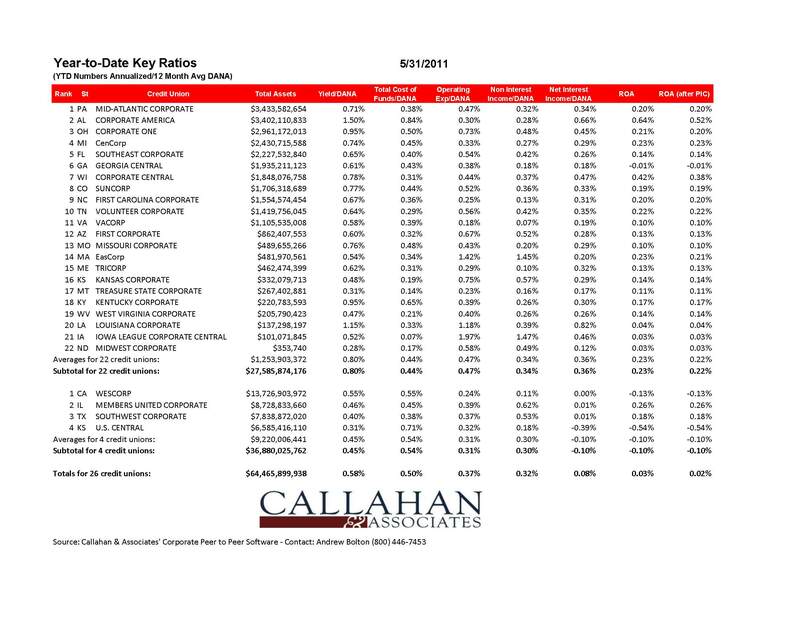 Click here and here for Callahan & Associates data on corporates. These corporate results have been achieved in the face of historically low rates (low margins) and having to respond to four new 704 regulation remakes and updates issued by NCUA in less than 12 months. This continual rewriting the rules of the game are in addition to the requirement that all business plans be approved by the regulator, no matter the corporate’s financial condition. Of the corporates still operating at May 31, WesCorp would have ranked fifth in total capital and ahead of the two surviving corporates that were conserved last fall (Southwest and Members United, now Catalyst and Alloya.) So why didn’t the WesCorps re-chartering proceed? Why Isn’t $90 Million Enough? The answer is unclear. Is it the lack of a viable business model? An unrealistic capital goal? A lack of support from large credit unions? Regulatory rigidity that did not permit a plan B? Consensus that the corporate system is not needed because multiple substitutes are available? A failure of leadership? All of these may be factors in the outcome. However I believe there is another element that is even more critical to this re-charter failure—an element that applies to every credit union independent of this specific issue. Capital is a necessary but not a sufficient condition for any institution’s success. In credit unions, it may be even less critical than for other competitive firms. Credit unions start with no capital, just sweat equity and the determination to make a difference in a group or community’s collective life. Capital cannot substitute for purpose or the desire to make a difference. Similar to the differing economic interpretations for the future, any analysis will be heavily influenced by the motivations of those doing the forecasting. In many cases the forecast is meant to influence, not just opine, on future events. People want to see their judgment confirmed by future results-especially those with responsibility for the predicted outcomes. This can lead to a self-fulfilling prophecy, especially in circumstances in which the predictor can add their thumb on the scale. Moreover the tendency today, especially in light of the general failure to forecast the Great Recession, is to burnish one’s professional insight by declaring negativity. I was reminded of this current bias by the following story told some years ago by a traveler to England. This is tale of a man, who countered, in his own way the loud “prophecy” that the end of the world was coming. Help with the helpless, O Abide with me. And the English, who know all the hymns, one by one started to join him until all of us were singing those stirring words. In the case above, one person, one small voice makes a difference. Many people feel uncomfortable mixing a faith example and their daily endeavors, credit unions or otherwise. It is important to remember everyone believes in something, whether it’s money, power, an ideology, a business plan or even the human interdependence we all share. Nihilism today is not the absence of belief. Rather it is the absolute certainty that one’s view is the right one and all others, wrong or irrelevant. However, when disappointing moments occur, it is critical not to give up on ourselves, to become cynical or to surrender to naysayers who will always be speaking somewhere. Thank you so much for your assistance to my request for reconsideration as a co-borrower. The credit union contacted my daughter at noon on Friday to inform us that they were reviewing the loan application. By 2:30 p.m., the loan was approved. What a blessing! Today, August 29th, my daughter began her junior year at Kent State University. We are thankful that the student loan program will help finance her college education. Thank you for caring!! Now if each adds to this one small voice, then it is conceivable that even $90 million is more than enough. For the real asset that is the movement’s most valuable capital is the intangible trust built by generations who cared first and foremost about their fellow members' needs. This great movement exists today because people believed. If we give up our belief or our cooperative efforts, we are doomed. Thank you so much for holding up the beliefs. The movement can continue to flourish and help, if we believe it can. Absolute inspiration! This is the gospel truth, Chip. My own father used to tell a very similar story about staying the course, don't listen to all the grumblers and naysayers. Always do your best and even if wealth doesn't come, you will still be improving and will finish stronger because you didn't give up and you were dedicated to the task. The key is to pay attention to indicators, but don't be dragged down by them. Now I work for an employer that has said the same thing: Show up for work everyday, do your best, and we will all be productive and have jobs. That's what we do here. I believe it. Someone wiser than me said, If you don't stand for something, you'll fall for anything. I believe in the integrity and power of the credit union industry. Thanks for all you at Callahan do to keep us informed and moving forward. Our society as great as it is (and it is!) is going through significant transition - from The US Postal service to Amazon.com, the local bookseller to Chik fil A - all over the spectrum and we struggle at the speed of the transition. There are plenty who think they know the 'only right answer' - one size never did fit all and it does so even less today - whether tea or progressive - the party is right for only some. To think otherwise is foolish. Our biggest challenge is 'fear itself'. If we abide with God we will build our way into the future. thanks for seeing and saying so. Great message! Thanks for reminding us that faith in what we do is critical and irreplaceable. Very heartfelt and refreshing. John the Baptist was a solitary voice in the wilderness proclaiming the coming KING of kings. It takes strength and courage to speak out, but by faith in God, we can all have the strength and courage to stand firm on real truth instead of being tossed about by the changing winds day by day. The founding principles of this industry are biblical...helping those less fortunate. It's harder to adhere to the 50/50 (50% mission/50% business) tenet when the "other" 50% has been subject to so much scrutiny and inspection. Despite the downturn, credit unions that forget the importance of this balance are in danger of losing their uniqueness. Yes it does require faith. But without faith there is no hope. Without hope there is no future.